The final of the BBC's Apprentice is shown tonight and it is a good example of how blogs and online comment around TV shows is becoming more prevalent - and it is important for this to be recognised in online strategy. The Apprentice currently provides a good anecdotal backdrop to this thinking as there is significant online discussion around the programme. 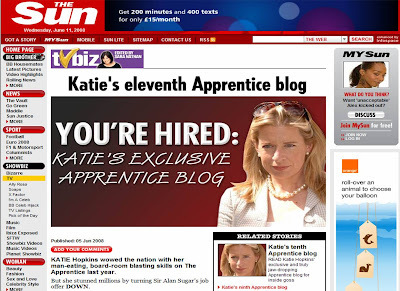 Most newspapers have comment - from former contestant Katie Hopkins recording her thoughts on a Sun blog to fired contestants posting on the My Telegraph platform, however the most interesting example is the Guardian's Apprentice 'Organ Gringer' blog. In the same way that Guardian journalists blog live around sports events / technology launches, Guardian journalist Anna Pickard live blogs during each episode of the Apprentice. A devoted following have been leaving hundreds of comments as the show progresses and these are a visible manifestation of the trend to watch TV at the same time as using the internet - though it would be great to get more statistics on this! Perhaps this is also a justification for the BBC plan to create a web page for every show in the BBC archive? The BBC could easily form communities around these pages and use them as a focal point for fans, rather than see other media organisations hosting discussion groups around BBC programming. Indeed developing interactive discussion around popular shows would be a major draw and could even see the BBC archive leveraged to create a significant social platform, especially if over time actual footage and episodes were made available. The role of the internet in TV viewing is therefore not just based around catch-up TV and video on demand. Blogs and social media can be used to expand programme reach and audience interaction, with event TV like the Apprentice proving particularly popular - we are heading to a point where all TV be 'social' with viewers being able to feed back throughout every programme. Social media offers some interesting opportunities for two-way dialogue between programme and viewers, and as technology gets more sophisticated this level of this interaction will surely increase?